Have you been looking for a nice dry and warm place to skateboard this winter? Well the Superior Community Skatepark Association has got you covered. 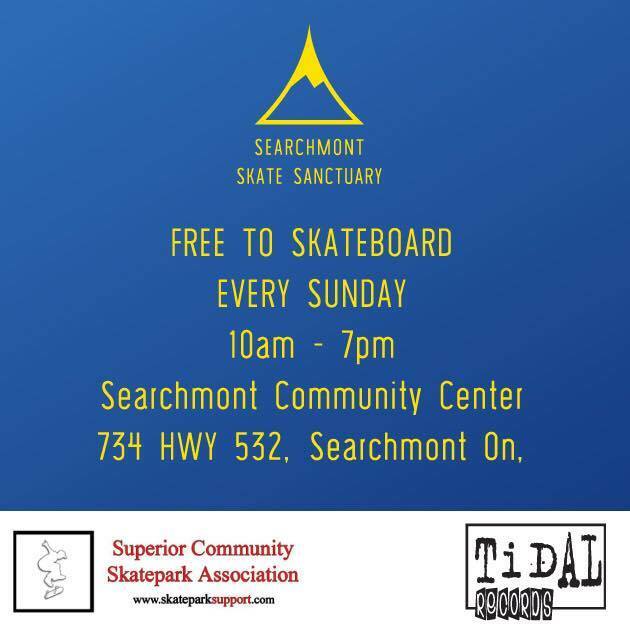 The SCSA has rented out the Searchmont Community Center assembly hall for every Sunday until the end of March for our use. 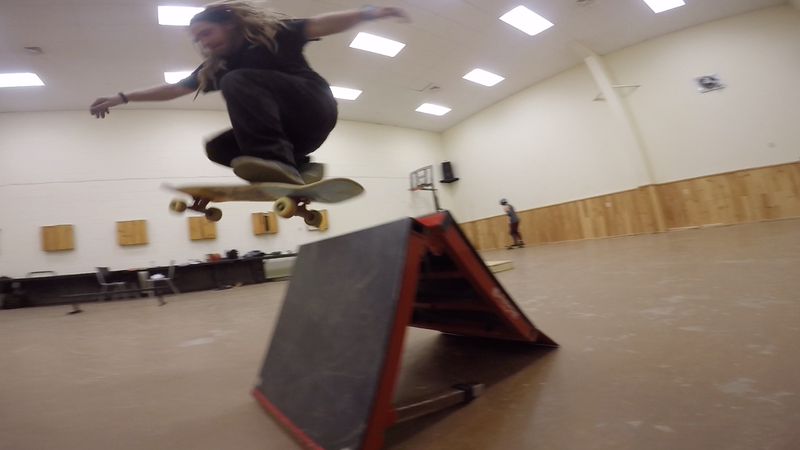 This isn't a skatepark but you can bring your own boxes and rails. Skateboards do mark up their painted floor, but the rent money collected for the space will pay for the paint to re-do the floor in April. The community of Searchmont will be depending on us to volunteer our time to paint the floor. Also a special thanks to our sponsor Tidal Records for covering the cost of rent for the entire winter! Come prepared to skate! Fill out a form today and bring it with you! Got a business and looking to engage our audience? We've got a form for that too! Follow highway 556 and highway 532 into Searchmont. It's about a 45 minute drive north of Sault Ste Marie. The ramp is located at the Searchmont Community Center. 705VideoMagazine, the Superior Community Skatepark Association and the City of Sault Ste Marie are proud to bring you the KICK OFF Contest 2011! For those who may not be aware, the current skate park is only Phase 1 of a 2 Phase project which inlcudes a BOWL! In order to kickstart fundraising efforts to complete Phase 2, we are holding a skate contest and giving away insane amounts of prizes! Contest categories will include Best Run, Best Trick (multiple platform choices) and a fun but fast version of a game of SKATE for all skill levels. Details available at registration booth on July 10th. Entry fees will be based on which prize pool you want to be in. Prizes will increase in value in each prize pool. This will allow for everyone of all skill levels to participate with people of similar skill level increasing your odds of winning. All Entry fees will be donated to the SCSA - Phase 2 Fund. Please note: HELMETS ARE MANDATORY and a WAIVER MUST BE SIGNED TO PARTICIPATE. A link to a printable waiver will be made available July 5th - link to be provided. Parents can sign waiver and send child to the park with contact info for confirmation. Sign up at the skatepark between 1:30 and 2:00pm Sunday July 10th to enter. Finn Fest was a blast!!! Thanks for all the support and congratulations to all the winners! Please note the skatepark is officially still a construction site. Please stay off the park until the signs come down and the landscaping has been completed. Once the construction site signs come down we'll be able to skate it. Be patient, the park will be good to go very soon! (Sault Ste. Marie, ON) Construction of the Community Skatepark will soon be complete! Once the area surrounding the concrete portion of the skatepark has been finished, it will open for public use. Skateboarders and bikers are asked to refrain from using the skatepark until construction is finished. Police are increasing supervision of the area and action will be taken against individuals who disregard the notice to stay out of the construction area. The skatepark is intended for skateboarders and in-line skaters only. BMX bikes and bicycles will not be permitted to use the skatepark due to damage that could be caused to the facility. Also we've picked a date for the official grand opening ceremonies, Saturday June 27th. Stay tuned for more Grand Opening Ceremonies information. 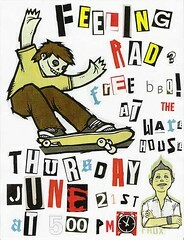 MUSTANG SALLY phase II skatepark fundraiser! For three years now the SCSA has been invited to join Buskers on Queen Street for the Sault Youth International Association's Buskerfest, and it's always been a blast. This year was no different. Rock to Roll - Don't miss it! The Sault Area Music Committee has come together to throw a 14 band concert @ the Knights Inn , July 27th, 2008 to Rasie money for the Develpoment of the Sault Ste Marie Skate Park. Doors open @ 12:30pm 10 bux to see all the bands Lots of great door prizes Wild prizes to be drawn. Door Prizes; Movie passes, tans, meals, Skateboard equipment and accessories, memberships, and much much more. Thanks to all the skaters that came out and joined us in the Rotary Fest Parade! It was a hot and long skate but well worth seeing everyone and hearing their encouraging words. In Kind Donations Received !!! The Superior Community Skatepark Association is proud to announce that the skatepark construction initiative has received some significant in kind material donations from some community leaders. 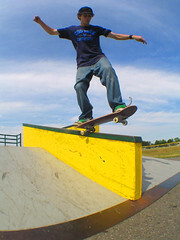 Fourteen-year-old Dave Williams has only been skating for two years, but thinks he has the skills to warrant a sponsorship from West 49. 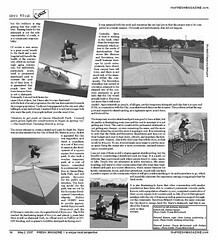 At the age of 12, with only three short weeks of riding under his belt, Williams took first place in the "most advanced" category during a skateboard competition hosted in the Toronto area. To celebrate International Go Skateboarding Day, Williams and about 18 other aspiring riders came out and showed off at the Superior Community Skatepark Association's (SCSA) skateboard competition held this afternoon in the parking lot of the John Rhodes Community Centre. Events included demonstrations and competitions for all age categories, with prizes provided by West 49 and The Rad Zone. A definite highlight was the "best tricks on the spine" contest. Kaleb Demour placed third for his frontside flip, earning him a DVD prize package. Placing second and taking home a new set of wheels for his pop shuv-it to fakie, 50-50 off the side, and fast-plant transfer was Mathew Ladouceur, AKA Skater Mattie. For successfully landing a kick-flip fakie rock 'n roll, a heel-flip fakie rock 'n roll, a frontside ollie to tail, and a frontside 180 pivot transfer, Taylor Cesco rode home with a new Bueno Stacey Lowery deck and first place. June 21st is International Go-Skating Day! 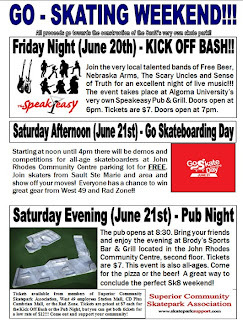 To celebrate this event your Superior Community Skatepark Association is organizing a weekend of great events!! Friday June 20th - KICK OFF BASH!! 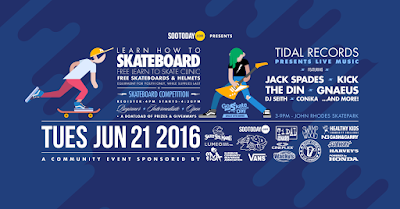 Saturday June 21st (12:00 noon) - SKATEBOARDING COMPETITION!! 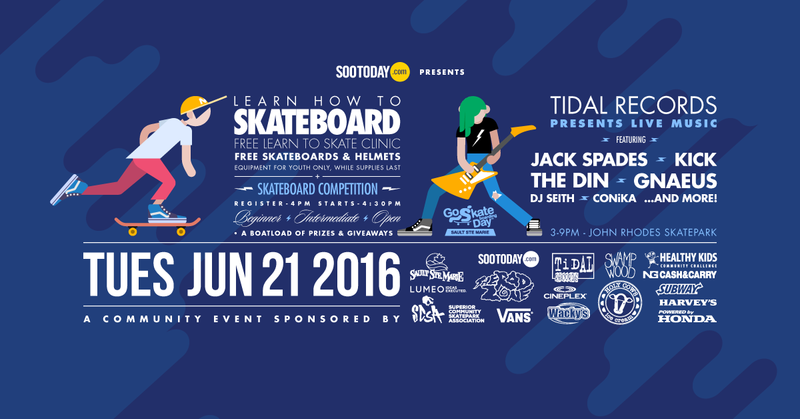 Starting at noon until 4pm there will be demos and competitions for all-age skateboarders at John Rhodes Community Centre parking lot for FREE. 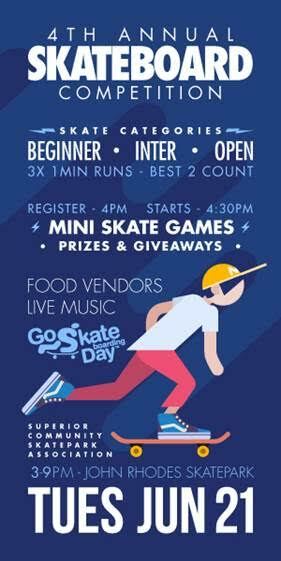 Join skaters from Sault Ste Marie and area and show off your moves! Everyone has a chance to win great gear from West 49 and Rad Zone!! Come out to compete or come out just to skate!! Saturday June 21st (Evening) - PUB NIGHT!! The pub opens at 8:30. Bring your friends and enjoy the evening at Brody’s Sports Bar & Grill located at John Rhodes Community Centre, second floor. Tickets $7.00 This is also all-ages. Come for the pizza or the beer! A great way to conclude the perfect Sk8 weekend! Tickets available from members of the Superior Community Skatepark Association, West 49 employees Station Mall, CD Plus Cambrian Mall, or the Rad Zone. Tickets are priced at $7 each for the Kick Off Bash or the Pub Night, or advance for both tickets at low rate of $12.00!!! Come out and support your community! ALL PROCEEDS GO TO THE CONSTRUCTION OF SAULT STE. MARIE'S VERY OWN SKATE PARK!!!!!!!! Battle of the Bands raises some cash for our park! 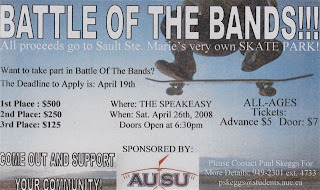 Many thanks are needed for everyone involved in helping make the Battle Of The Bands at Algoma University's Speakeasy a success. First of all thanks to Paul Skeggs of Algoma's Students Union, George Ravlich of Crank Sound Distribution, and Algoma's Students Union for hosting the event and donating the prize money for the bands. It should also be noted that Stephane Guindon and Hitman Productions came out of nowhere to help step the event up a notch with an addition first prize of an invitation to open for an even bigger and better event, a skid row concert this summer! Also we can't forget all the bands, because without them there would've been no show! 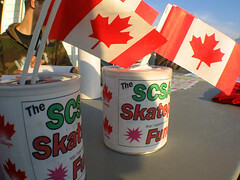 Overall this event raised just over $1600 for the SCSA skatepark construction fund! Congratulations, to Sense of Truth for taking first place by storm! 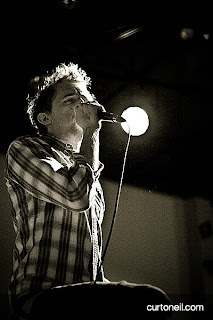 Also, for more event coverage check out Slackhopper's coverage at SooToday.com "Sense of Truth opens for Skid Row (video, photos)"
For more great photos like the one pictured above of Wayne Watkins front man of The Blockade check out Curt O'Neil's Murderfly Media Gallery. 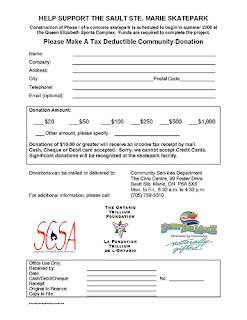 Skatepark Donation Form - Available for download! Skatepark Donation Form is now available as a download! Just click the link to download the PDF file, print it, fill it out, and drop it off at City Hall. The form goes back to the Community Services Department and they are in the office at your first right through the front doors of the Civic Centre. Mon. to Fri., 8:30 a.m. to 4:30 p.m. Doors open at 6:30. Rockin' out begins at 7:30. -Entrance for bands is $25. -Deadline for band entrance is April 19th at 5pm. The format is for 8 bands, to each play 3 songs. Then the judges will determine the final 3 who will have an additional 2 songs. All proceeds are going to the development of the Sault Skate Park. 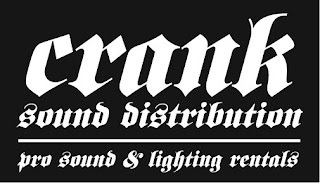 SPECIAL THANKS to Algoma University's Students Union and Crank Sound Distribution for sponsoring this event !!! Tickets are available at Algoma University and from members of the SCSA fundraising committee. This event has tickets! If you don't get a ticket you are NOT gauranteed entrance on the day of the event! The design photo above shows a zoomed in view of the street section design, which is part of "Phase 1" of the skatepark project. The photo below shows the two phases, street section "Phase 1" and the bowl section which is "Phase 2." 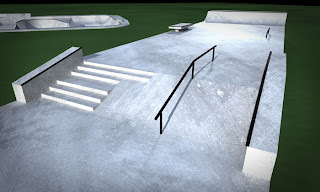 Sault Ste Marie's skatepark project got a large boost today from the provincial government. 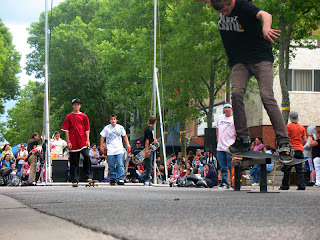 The City of Sault Ste Marie in partnership with us the SCSA received a grant of $75,000 towards the construction of a concrete skatepark facility. David Orazietti got on board in a big way today. The Sault MPP presented Travis McCormack, president of the the Superior Community Skate Park Association (SCSA), with a cheque for $75,000 from the Ontario Trillium Foundation. McCormack's association still has a little further to go to meet its fundraising goals. "We're looking to raise about $38,000 more in material donations and we're hoping some community leaders will come forward with those," he said. "We need concrete, rebar and wood for the forms as well as a concrete pump and a small Bobcat." The association also wants to get the second part of the two-phase park going as soon as possible and will be starting its fundraising in earnest now. 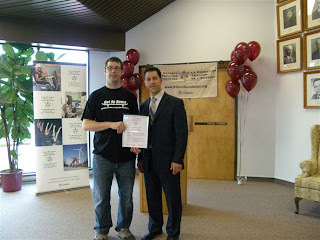 Pictured above is MPP David Orazietti presenting SCSA president Travis McCormack with a plaque on behalf of the Trillium Foundation. Thanks to volunteers Marc Gratton, Taylor Cesco, Carrie McCormack, Aiden McCormack and Dax D'orazio for spending their Canada Day raising funds for our skatepark construction initiative. The unofficial tally for selling the Glow-in-the-dark necklaces during the fireworks display was approximately $1300 before costs we calculated in. We'd also like to thank Lori Ballstadt (Assistant Manager - Recreation and Culture Division) for the opportunity and Summer Reitveld (Summer Program Assistant - Recreation and Culture Division) for all the help. Many thanks to everyone who helped put together the Ontario Trillium Foundation grant application. Especially Deane Greenwood (Parks and Recreation Advisory Committee - Skatepark Sub-committee member) for getting the ball rolling in the right direction and bringing his previous application experience with him. I'd also like to point out from whom we have received letters of support for this skatepark construction initiative. All these letters of support have been attached to the application. It's likely we'll receive a decision from the Foundation in October or November, and we'll definitely keep you posted here! Fire Damage - again ! The center piece of the Sault Ste Marie temporary wooden skatepark was set aflame again! Good news though, the city crews were able to make the repairs within one day which only left the ramps barricaded off for a short time. Many thanks to the city carpenters for the speedy repairs .... now GO SKATE !!! 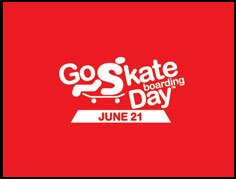 It's International Go Skateboarding Day on June 21st the first official day of summer. Come on out and skate with us. Free barbeque burgers and dogs downtown this Thursday June 21st at 5:00 pm. Many thanks to volunteer Dax D'orazio for setting this whole event up and The Rad Zone for providing the prizes! Many thanks to Tara Lappage for volunteering and to working hard on this article that ended up as the cover story for the May / June issue of FRESH Magazine! Visit FRESH magazine online or pick up a copy in print today. To see the online copy of the whole issue follow this link to a pdf version - The May / June Issue. Local youth seek action from new council. Front page news for Tuesday October 10th, the youth speak out about issues that concern them and the city of Sault Ste Marie. The skateboard park project was refered to several times and was actually the only specific project besides the youth strategy officer position and bike path project that was mentioned in the front page article. "Jobs aren't necessarily the only issues." Sir James Dunn Grade 12 politics student Matt Cuddy said the city's next mayor should focus on beautifying Sault Ste. Marie and incorporating lifestyle improvements. Cuddy, who will vote for the first time on election day, said "we need an active lifestyle to be vigorously cultivated in Sault Ste. Marie. We need bike paths, alternatives to roads and transportation." "The Sault Ste. Marie Youth Council will be hosting a mayoral debate on Thursday Oct. 19. The session, to be held at the Civic Centre Russ Ramsay room, will run from 6 to 9 p.m. and give youth the opportunity to hear from the mayoral candidates on their platforms. A question-and-answer period will also allow youth to quiz the candidates on their areas of interest. All are invited to attend." 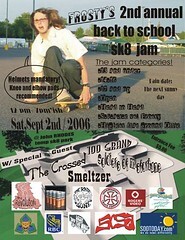 This Saturday September 2nd Frosty's Back To School Skate Jam is back for the second year in a row. If it was anything like last year, come prepared for a ton of prizes for everyone from all the sponsors. Many thanks goes out to Frosty for being there again this year and organizing this great event that benifits everyone involved. Don't forget your lid. Helmets are Mandatory for all entries! 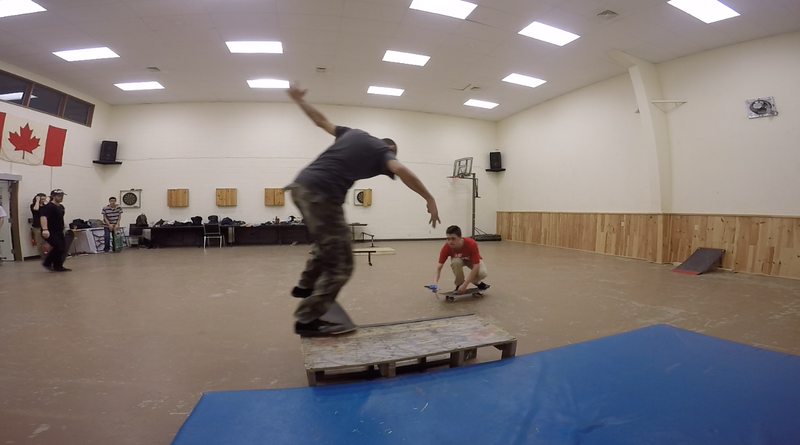 Thanks to everyone that came out and had some fun skateboarding and learned some new tricks. 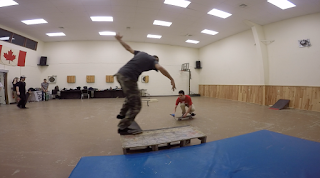 The skateboard clinics again this year were very successful. 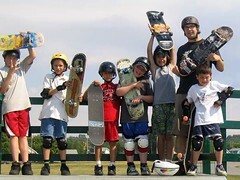 This year we saw more and more young skaters, including many six year olds which is the lower limit for the clinics. One of skaters even had his two year old cousin come out and show us what he can do on a skateboard, and to say the least we were all very impressed with his passion for skateboarding and abilities. I should also mention there was increase in the amount of girls that signed up for the clinics this year, which is great to see. One of the girls came out with her brother and the other, Cassidy, started from her first day on her brand new skateboard with the clinic and came back two more weeks after a very successful first week. Thanks to Curtis over at betterthancrabs.com for the mention in his blog. It's always great to hear supportive comments and see supportive actions made from people in our own community. "To begin with I never was a skateboarder and I probably never will be but that doesn’t deter me from thinking that this group is trying to do something good for the Sault." To read further hop on over to betterthancrabs.com and look for the August 15th post. Thanks to the Sault Youth Council for inviting us to setup a booth at buskerfest 2006, and to Justin Roy, Mike Trudeau, Joe Seeber, Mark Gratton, Mike Bell, Dan Pandzic and Anthony Armstrong for coming downtown to skate! The SCSA has been offered an opportunity to setup a table at Buskerfest this year. This would be a great opportunity to get more community exposure and collect some donations. If anyone would like to hang out during buskerfest, and sell t-shirts or just give the general public information about who we are, your help would be much appreciated. Buskerfest runs August 11, 12, and 13th. That's Friday, Saturday, Sunday next week. The more volunteers we have the more we can break up the times between each other. There was also talk about setting up a Game of S.K.A.T.E. contest, but that depends on interest and volunteers. Email me (Travis) at superiorskate@yahoo.ca or leave a comment here so we can get in touch. I can also be reached at 542-4158. Just wanted to let everyone know I've added a link to a free forum, the SCSA Forum, for any extended dialogue or any talk about stuff that isn't posted about in the blog here. 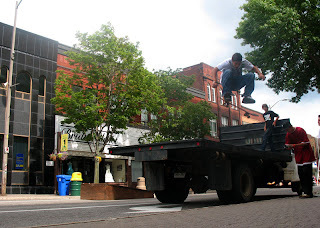 Also, if you've been looking for more Sault skateboarding photos I've added a Flicker Zeitgeist to the sidebar. It's pretty trick. It rotates photos from the contacts of the superiorskate flickr account and each small photo is clickable. Keep an eye out for AJ Armstrong's shots because they've been getting better and better, and he can shoot 8.5 frames per second!!! It's all about the sequence shots. Thanks for clicking those google ads also. 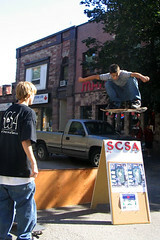 By supporting those advertisers we've raised over $50 for the SCSA Skatepark Construction Fund. Sudbury Skatepark - NOW OPEN !!! In use during recent weeks by crowds of skateboarders and bikers who were too eager to wait, the Minnow Lake Skate Park is now officially open to the public. 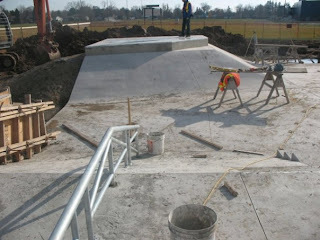 The construction of the 10,000 square-foot skate park, located in front of the Carmichael Arena at 1298 Bancroft Dr., began in November 2005. "It is very exciting to see this vision take shape,” said Greater Sudbury Mayor David Courtemanche. "The Minnow Lake Skate Park is situated conveniently on a Greater Sudbury Transit route, and has a beautiful view of the lake – a great location for our youth to gather." Cool, the SCSA in the news again. "Devin Service, 9, takes a lesson in skateboarding Monday from Travis McCormack, president of Superior Community Skatepark Association. City-sponsored clinics are running throughout the summer." From the Sault Star's newspaper printed Wednesday, July 19th. 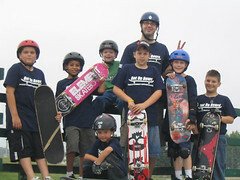 Keep an eye out for the SCSA and City run Skateboard Clinics on channel ten the Shaw Cable channel. The segment should already be running, and is supposed to run close to 200 times. 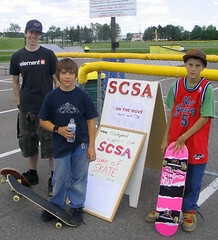 The SCSA and the Skateboard Clinics were in the news a few weeks ago on the CTV Network. Most folks from the sault saw the footage on MCTV. Suprisingly, Fred Kember down in Kitchener even saw the segment. I'm not sure how many saw the news segment, but I didn't expect it to reach anyone past Sault Ste Marie or Sudbury. The segment had a few short interviews with some young skaters and myself. There was also a good showing of everyone skating our temporary park. Thanks to CTV News for dropping by. I heard from a few people that the Skate 4 Cancer crew was ripping around on their longboards during the Rotaryfest Parade. I decided to look them up. Visit www.skateforcancer.com to support a good cause. 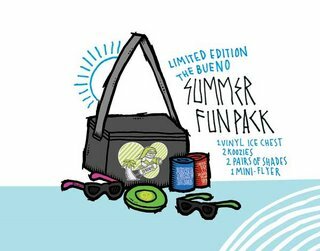 Shortly after the Local DC Nationals contest, Dax D'orazio from Revolution Skateshop offered up a brand spanking new Bueno Summer Fun Pack as a prize to an impromtu Best Trick Contest. Danny Lepage stomped down more tech for this win. (Was it the big switch shuv over the hip the trick that sealed the deal?) No doubt a good end to the night of skating. First of all I'd like to thank all the volunteers that came out to the RB Pavilion to help out. Dan Pandzic, Anthony Stefanizzi, Colin Scharbach, Victoria, Carrie McCormack, Georgina Naccarato, and thanks to Paul Norbo for the moral support, , and Lori Ballstatd for the opportunity. It was a long day in the trenches for the SCSA Volunteers this Canada Day. Rain, wind, sun, and long hours, but we toughed it out and came out on top with our fundraising efforts. The main reason we were at the pavilion was the sale of those glow stick necklaces. The price was set at three glow sticks for $5 or one glow stick for $2, and they went like hotcakes after 9:00 pm. The informal tally at the end of the night was a $500+ profit. The official number will come from the city whose float we used and they also made the initial purchase of the glow sticks. We also sold three SCSA t-shirts, and soon we'll need to make a new order to replenish the stocks. I was considering making t-shirts out of this drawing, skatepark support.com pictured below, that Colin made up while hanging out at the fundraising table. What do you guys think, is it time for a change from the trusty "Get On Board" t-shirts? Also, we should mention that Carrie and I also went out with the glow sticks on the American's Fourth of July and sold more glow sticks for more funds. 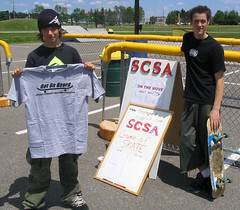 We earned another $125 for the SCSA Skatepark Construction Fund. Thanks to all the customers too!!! After a successful start last summer, The SCSA and the City of Sault Ste Marie are once again offering Skateboard Clinics. This year you can download the registration form off the internet directly from the City's website. Tuesday, July 18 to Thursday, July 20 - 9:00 a.m. to 12:00 p.m.
Tuesday, July 25 to Thursday, July 27 - 9:00 a.m. to 12:00 p.m.
Tuesday, August 15 to Thursday, August 17 - 9:00 a.m. to 12:00 p.m.
Tuesday, August 22 to Thursday, August 24 - 9:00 a.m. to 12:00 p.m.
Tuesday, July 18 to Thursday, July 20 - 1:00 p.m. to 4:00 p.m.
Tuesday, July 25 to Thursday, July 27 - 1:00 p.m. to 4:00 p.m.
Tuesday, August 15 to Thursday, August 17 - 1:00 p.m. to 4:00 p.m.
Tuesday, August 22 to Thursday, August 24 - 1:00 p.m. to 4:00 p.m.
For additional information, please call the Community Services Department, Recreation and Culture Division at 759-5310. Many thanks go out to everyone who has donated!!! Many have donated their time, skills, and cold hard cash lately. Thanks go out specificly to an unknown youth who dropped off close to $100 in the donation bin at Revolution Skateshop last week. Word was he had been collecting for some time and forgot it in his closet, and decided it was time to drop it off. Also, Rubbergorilla of flickr.com fame was the first to donate online. It was a pleasent surprise to find the donation notification one morning while checking the SCSA email. I can't go without mentioning the logo from Jake Trumble also. Nice clean style if you ask me. Just thought you guys might be interested in what I found on sootoday.com the other day. A letter from Tom Sinclair - Tom Sinclair wants to know why SSM hates skateboraders. Needless to say I was suprised this was in the Students Domain Section of sootoday's website. Feel free to leave some comments here. Thanks to everyone that has used the google ads found at the very bottom of our website. To date we have made 35 bucks just from your clicks, and once we recieve $50 we will recieve a check. I recieved word from the city today that the flat-bank fire damage repairs have been completed. The DC Nationals - Local Qualifier has yet to be rescheduled, check back here soon for updates. 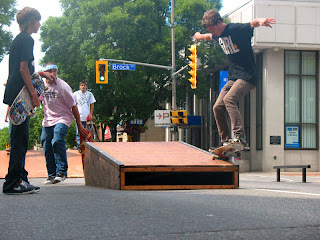 From what I hear the ramp that Roy is Switch Kickfliping on, in AJ's photo, has fallen victim to some amateur arsonists. 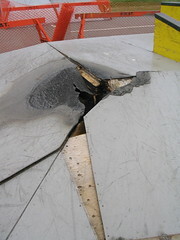 Thankfully only a small portion of the riding surface has been affected, although the whole ramp including the quarterpipe has been temporarly blocked off. This Sunday June 25th there will be another opportunity for our local skateboarders to move on into the provincial and national skateboarding contest scene. 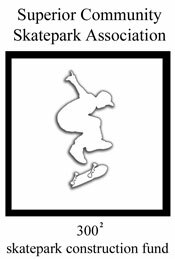 This year the top three skateboarders in this judged skateboarding contest will be invited to compete at the provincial level in Mississauga (Iceland park,) and then have the opportunity to move on to the nationals in Calgary (Slam City Jam). Last year Matt Lajoie and Kyle Eaton competed at our local contest, and moved on to the provincial and to the national level. Registration will begin at Noon with the contest beginning at 1:00 pm. All participants under 18 years of age are required to have a waiver filled out by their parent or legal guardian. You can download these waivers directly from www.dcnationals.com, or click here --> Waiver Form PDF. 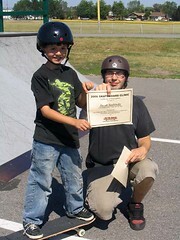 Please bring the waiver with you to the John Rhodes Centre Skatepark, or bring your parent and fill one out on-site. 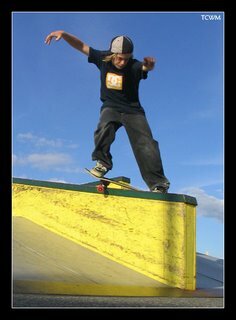 Where: John Rhodes Centre Skatepark - Near Elizabeth St. and Trunk Rd. Thanks to Brent Millard at Evolushun and to DC shoes for making this contest happen. Everyone is welcome to come including spectators in addition to those competing. Click our Ads and we will be one step closer to completing our fundraising goals. Our current fundraiser is the 300 squared program where 300 donations of 300 dollars from businesses or individuals would raise enough funds on behalf of the community to construct our world-class skatepark.